I’m doing a tip everyday for our October Challenge and here is today’s tip: Use Daily Deal Sites to find special offers and discounts. 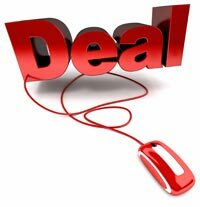 Are you familiar with Daily Deal sites like LivingSocial and Groupon? Well you might be missing out on deals for local exercise bootcamps, yoga classes, healthy meals at restaurants, local food growers, food co-ops, fitness centers and more. Of course, each area is different, so if you are in a small town…I can’t say what is available for you on the more location based sites. However, there deals to be found on fitness products as well. Just keep in mind that all these deals expire and if you see a deal one day…it could be gone the next day. Make sure that you look for dates when you search and in the terms of the deals. LivingSocial – This site gives you the incentive to share. “After you purchase something, you can tell all your friends. Tweet, post to Facebook, or send your unique link to friends in an email. If three people buy that deal with your link, your deal is free!” That’s awesome. I usually look under Local and then pick the category “Sports & Fitness” to find great deals on classes, bootcamps and gyms in my area. I’ve also been able to try out expensive local restaurants on the cheap for healthy meals. Groupon – Check out the “Health and Fitness” section of the Groupon site for deals in your area that help can make losing weight loss and exercise classes more affordable. Active GearUp – Deals on workout gear from a wide variety of brands. From gym shoes to bike wheels to hiking bags…the deals are different depending on when you visit the site because they expire. Bottomline, I love it when I can try an exercise class for a discount and see if I really click with the trainer or try a new form of working out without having to commit to a package of classes or buying a membership. I also love going to restaurants with high quality ingredients, but not breaking my budget. These daily deal sites help to make this happen. Check them out. You might not see a deal for you today but you never know when you may be looking to try something new to help motivate you on your weight loss journey.